Hillside Mine Heritage Railway (HMHR) is my second model railway located in the fictional place of Hillside in mid Wales, the first you may remember was Hillside Works. Both layouts have been inspired by a combination of the Brecon Mountain Railway, near Merthyr Tydfil, and the mining heritage and countryside of the surrounding area. The scenario is that of a drift mine that was re-activated for local coal supplies during the miners strikes of the 1970's. 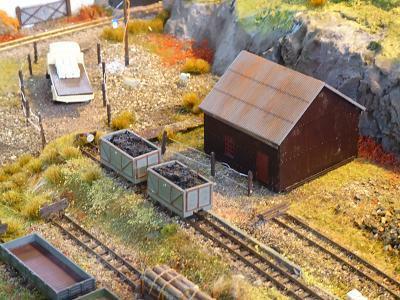 lt is situated near a preserved narrow gauge line and industrial site, my model railway Hillside Works. This allows the use of a mixture of stock, both kit built and proprietary, with some preserved steam but mostly working diesel. 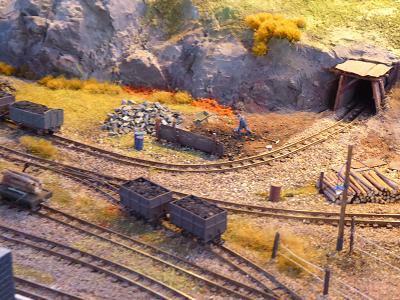 Hillside Mine Heritage Railway (HMHR) is still a work in progress, as are most layouts. My model railway has been designed to stand alone or displayed side by side with Hillside Works. Future plans include, expanding and populating the heritage theme, adding Arduino controlled sounds and building a simple visitor station stop and cafe on the main loop.